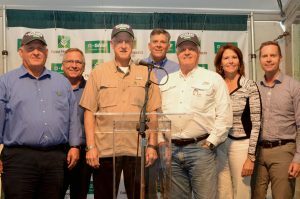 House Agriculture Committee Chairman Mike Conaway (R-TX), Ranking Member Collin Peterson (D-MN) and members of the committee hosted a farm bill listening session at the Farm Progress Show Thursday in Decatur, Illinois. It was the fifth such session the committee has held so far. “This was a terrific listening session that will benefit us as we write the next farm bill,” said Chairman Conaway at a press conference following the session. “Today’s listening session was a continuation of the Agriculture Committee’s efforts to hear directly from the varied interests, across all regions of the country, who are impacted by the farm bill,” said Ranking Member Peterson. Others who took part in the listening session were Glenn Thompson of Pennsylvania, and Illinois Representatives Mike Bost, Darin LaHood, Cheri Bustos, and Rodney Davis.